Laminate flooring is a versatile product that allows you to achieve the look of a variety of natural materials, without the high cost and difficult installation associated with those choices. Laminate can even mimic natural brick, as in this restaurant dining room with laminate tiles laid in rows of red and gray, simulating the look of slate and brick materials installed side by side. One of the most popular uses for laminate floors is to simulate the look of a natural hardwood. The laminate flooring in this dining room has been manufactured to be highly distinct, giving it a life-like quality and a formal elegance. Rather than looking like a knock-off, the floor actually blends seamlessly into the style of the space, complementing the hardwood chair and dining set. One of the advantages of laminate flooring is that it is resistant to stains, wear, and UV rays, making it a popular choice for hallways, entryways, and, in this case, a wide-open sunroom. The laminate planks match seamlessly with the teak furnishings to create an oasis of sun and light that uses the best elements of both the interior and the exterior world. The natural grain features in the floor accurately simulate hardwood characteristics, making this entire room feel like a natural setting. Laminate flooring has the ability to simulate any wood color, grain, or style, and sometimes it can even improve on nature a little bit. Here we see a faux hardwood laminate in a golden oak finish, treated with “vibrant finish,” a process that makes the colors and features in the material really pop. Laminate flooring can do more than simulating just the look of natural hardwood. With embossed planks, manufacturers actually work the texture of the real material into the surface of the flooring. In this living room, a smoky red oak laminate with a highly patterned surface has been installed against a stone wall with a fireplace and matched with red and gray accents to create a room with a dark, intimate appeal. The floor planks have beveled edges, enhancing the textured effect. Hardwood isn't the only type of natural wood flooring that laminate can mimic. This country-style living-and-dining space gets the perfect antique look from the stained wide plank pine laminate flooring. The variation in the coloring gives it a particularly authentic look. There's no rule that says what color a wood floor has to be. This laminate flooring combines all the texture and visual depth of old wood with an eye-catching weathered-gray color. The combination adds the perfect touches of warmth and contrast to this clean, modern space. The look of a variety of natural stone materials can be captured in the decorative layer of laminate flooring materials. This kitchen floor is covered with Mojave faux slate laminate tiles for a natural, multicolored effect. This heavily patterned material is matched with simple black and white kitchen accessories, creating an interplay of dynamic energies. Most hardwood flooring is finished with polyurethane, giving it a glossy sheen. This is why high-gloss laminate flooring, perhaps surprisingly, can actually look more like real hardwood than other laminates. High-gloss finishes offer similar scratch-resistance and durability to more matte laminate finishes, so the choice of standard vs. high-gloss really comes down to looks. White quartzite tile would be a perfect fit for this hard-working room, but laminate can do the job almost as well. 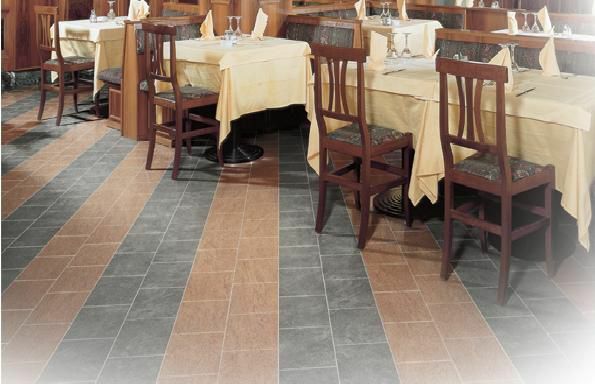 This faux-tile flooring has an embossed surface and even recessed grout lines to fool the eye (and maybe even the feet!) into thinking this is real quartzite tile.